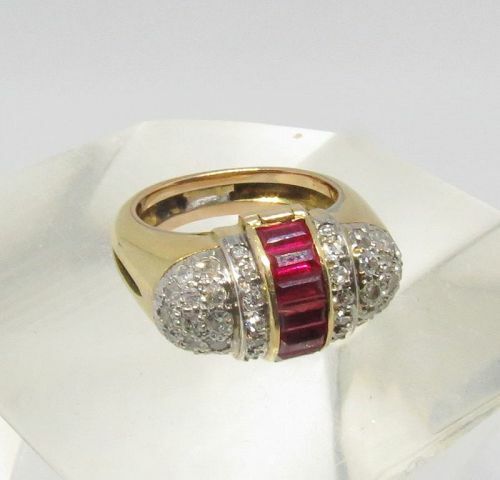 Antique, Art Deco Era, poison ring, composed of 18k yellow gold, Rubies and Diamonds. Top of this size 5.5 ring measures 21mm x 12mm. This gorgeous poison ring consist of approx. 1.2ctw of sparkly diamonds and 1.2ctw of pigeon blood color rubies. The ring is in very good antique condition. Weights 7.24 grams. Magnificent pair of earrings, composed of antique carved jadeite jade plaques, natural seed pearls, 18k white gold and diamonds. The earrings are for pierced ears; measuring 2 3/4" x 5/8". They consists of about 0.25ctw of H color diamonds. Condition is perfect. Weight is 9.77 grams. Jade has gorgeous carvings on both sides. Art Deco, 14k yellow gold, natural salmon color coral and malachite bead necklace with crystal and diamonds. The necklace is 26" long, Crystal pendant with coral and malachite butterfly accented with diamonds, measures 2" x 1.5". Necklace is in excellent pre-owned condition. Gold is marked 14k. Weight is 44.3 grams. 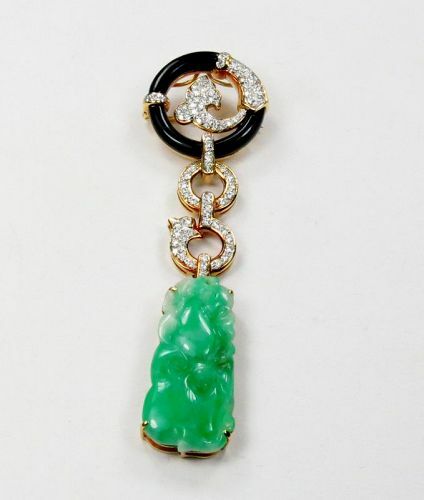 Vintage, brooch/pendant, composed of 18k yellow gold, natural untreated jadeite jade, black onyx and diamonds. This fantastic pin measures 3 1/2" x 1", it consists of approx. 1.95ctw of H color diamonds and double carved jade measuring 1 1/4" x 1/2". Pendant is in excellent pre-owned condition. Gold is marked 18k 750 P3. Weight is 19.85 grams. 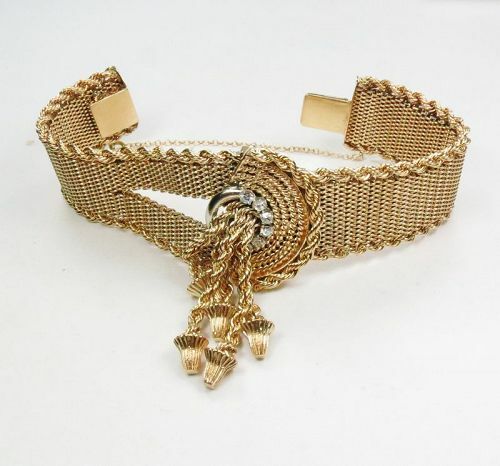 Beautiful, vintage 14k yellow gold, diamond tassel bracelet in excellent pre-owned condition. The bracelet consists of 0.35ctw of H color, SI1-2 clarity diamonds. It measures 7" x 7/8", the weight is substantial 79 grams. Gold is marked 14k. Beautiful, 14k yellow gold and carved coral flower necklace. It is 18" long, each of the 12 carved roses measures approx. 18mm x 12mm. This lovely coral necklace is in excellent pre-owned condition. Weight is 26.85 grams. Gold is marked 14k MSCO. A fantastic, pair of earrings composed of 14k yellow gold, carved natural, un-dyed tomato red coral, accented with sparkly diamonds and rubies. These day and night dangle earrings are in excellent pre-owned condition, measuring 2 3/8" long x 3/4" wide. The earrings consists of about 0.30ctw H color diamonds and 0.10ctw of rubies. Weight is 19.44 grams. Beautiful, circa 1940's necklace composed of 14k/18k yellow gold, natural opals, natural seed pearls and one H color SI clarity diamond. The 18k gold and seed pearl chain with newer clasp is 16 inches long. 14k gold pendant with 21 opals, seed pearls and diamond measures 1 3/4" x 1 1/8". This gorgeous necklace is in excellent pre-owned condition. Weights 15.16 grams. Gold is marked 14k and 750. 14k yellow gold, vintage, circa 1950's brooch/pendant. It consists of approx. 1.2ctw of H-I color diamonds. There are a total of 17 Diamonds in this pin with the largest at 0.15 and smallest 0.03ctw. The total weight of this brooch is 8.3 grams and it is in very good pre-owned condition. Gold is marked 14k. Vintage, 14k yellow gold, cultured pearl 2 part tassel brooch, pin. This unusual fish brooch with rubies, emeralds and pearls, measures about 4" x 4". Pearls graduate from 3mm to 8mm in diameter. Brooch is in very good vintage condition,pearls eventually needs re-stringing. Weight is 44.33 grams. 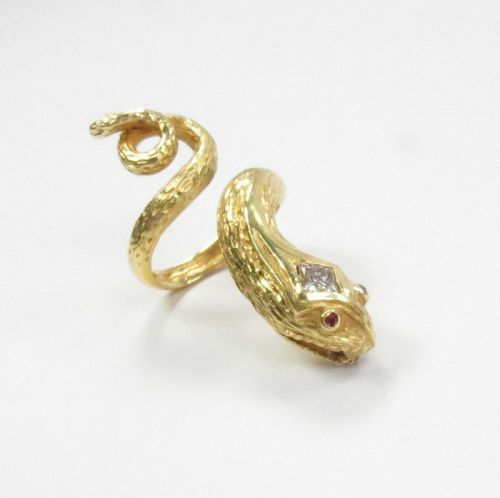 Fabulous, antique, 18k yellow gold, diamond snake ring with ruby eyes. This awesome, size 7 ring measures 1 3/4"" long x 5/8" wide. Gold is marked 750. Weight is 10.73 grams. Magnificent, heavy 18k gold, diamond, ruby bracelet with Longines manual watch. This adjustable bracelet, weights substantial 123 grams. Buckle with approx, 1ctw of diamonds and 0.40ctw of rubies measures 1 1/8" x 1", bracelet is 7/8" wide. This gorgeous bracelet with made in Switzerland Longines watch is in excellent pre-owned condition. Watch was just serviced. Gold is marked 750 and maker's mark. 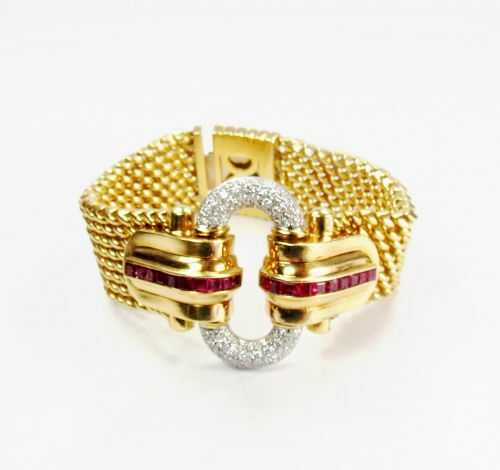 Magnificent, heavy, Italy Made, bracelet, composed of 18k yellow gold, 1.58ctw G-H color diamonds and 1ctw natural rubies. 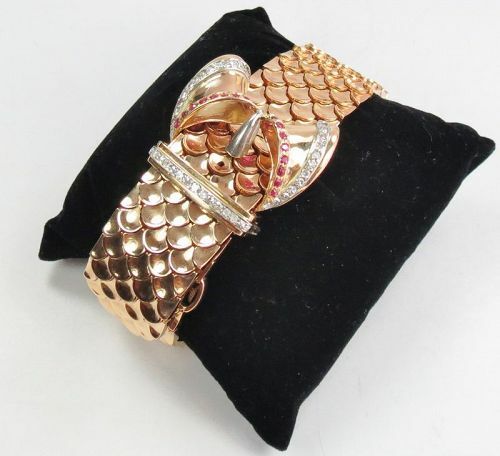 This fantastic bracelet will fit small wrist only; it measures 6 1/8" long x 1 1/4" wide. The weight is substantial 97.54 grams. Bracelet is hallmarked *1870AL 750, (AL Alessandria Italy). 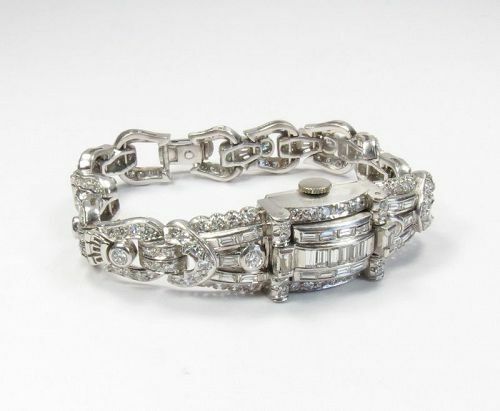 Stunning, antique, Swiss made, Tudor, platinum and over 4ctw of baguette and round cut diamonds lady's watch. This beautiful peek a boo watch is currently in very good working condition. Bracelet is 6 1/2" long. Watch consists of approx. 4ctw + of F-G color VS1 clarity diamonds. It weights 55.64 grams. Spectacular, 14k yellow and 18k white gold, natural, carved, green jadeite jade and approx. 0.45ctw diamond dangle earrings. This amazing pair consists of 2 carved round shaped jade pieces measuring approx. 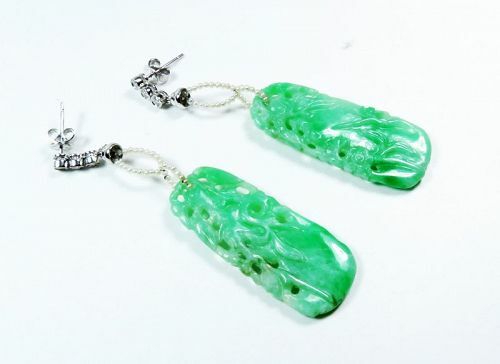 15mm in diameter, 2 pieces of jade pendants; measuring; 35mm x 12mm. The earrings are in excellent pre-owned condition. Each earring measures 2 3/4" long x 3/4" wide. Total weight is 11.48 grams. Wonderful, vintage, antique, solid 18k yellow gold chain necklace. It is 29.5" long x 3/16" wide. Gold is marked 18k, 750. This elegant chain necklace is in excellent pre-owned condition. It weights 25.76 grams. 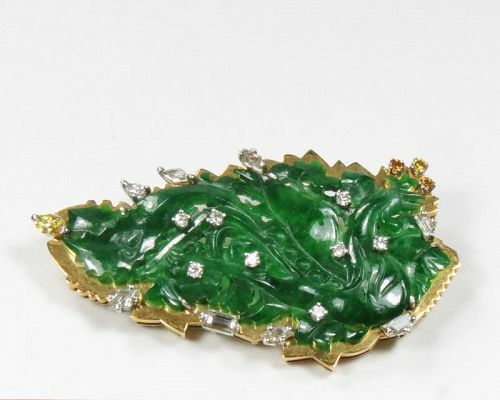 Chinese, 18k gold, carved jadeite jade, diamond brooch pin Certified. Stunning, certified, 18k gold pin set with beautifully carved deep green natural jadeite jade. This antique, carved jade piece was set (circa 1940's), in 18k yellow gold frame it is accented with over 1ct diamonds throughout as well as a fancy yellow intense marquise on edge and 3 other fancy yellows of approx. weight of 0.39ctw. This beautiful brooch with carved jade depicting phoenix measures 2 1/8" x 1 3/16". It weights 16.35 grams.